In a turbulent and rapidly-changing region, Hezbollah finds itself facing an unprecedented array of threats and challenges. Will it be fatally weakened if its strategic ally, the Syrian regime, collapses? Will it get drawn into, or trigger, a devastating war with Israel if Iran, another strategic ally, is attacked over its nuclear ambitions - and even if not? Will it find itself embroiled in a confessional civil war with the Sunnis in Lebanon, especially if Syria breaks apart and the region is plunged into a process of sectarian balkanisation? On top of all those very real possibilities, the militant Shia movement also faces further international censure and isolation following Bulgaria's accusation that it was behind the bomb attack which killed five Israeli tourists at the Black Sea resort of Burgas last July. It may also have had to tolerate a slap in the face from the Israelis on 30 January, when their jets struck what US officials insist was an arms consignment destined for Hezbollah at a military centre inside Syria. That triggered fears of a wider regional flare-up. Given the delicate, complex and explosive situation Hezbollah finds itself in, it is hardly surprising that leaders and officials have drawn in and give virtually no media interviews these days to share their views on the above questions. But many observers and analysts seem to agree that, while all those grim scenarios remain more than possible, they are by no means inevitable, and may well not happen. In terms of another war with Israel, Hezbollah has undoubtedly been building up its arsenal since the last one in 2006, irrespective of what happens with Syria's missiles and chemical weapons stocks. While some observers believe that a "critical mass" of preparation on both sides may mean that conflict is ultimately inevitable, there is certainly no sense at the moment that either is spoiling for a fight. Despite the imbalance of power in this conventionally asymmetrical match, Western diplomats believe that, with long-range Hezbollah rockets installed in the northern part of the Bekaa Valley and shorter-range ones further south, Israel would face three to four weeks of devastating hostilities if a new war erupted. Rhetoric aside, Hezbollah also knows that if war breaks out with Israel again, it will not just be the mainly Shia towns and villages of South Lebanon and the southern suburbs of Beirut that will pay a heavy price. Israeli leaders have made it clear that infrastructural and state targets will also be considered fair game, especially now that Hezbollah is the major power behind the Beirut government. The huge private and public investment in reconstruction after the 2006 war would all be lost. Hezbollah is aware that that is not something to be embarked on lightly, and that its own Shia community would be hardest hit. Hezbollah has scrupulously observed the ceasefire that ended hostilities in 2006. "It has no interest in picking a war, neither do the Israelis, who see the whole regional scene unfolding to their benefit," said one Shia source. So, left to their own devices in a purely Lebanese context, there is no reason to believe that another war between Hezbollah and Israel will necessarily happen. Developments in Syria may also fall short of triggering another such war, if the 30 January air raid is anything to judge by. If Hezbollah-destined weapons were indeed hit, the movement seems to have chosen not to regard it as a direct provocation. Diplomats say Israel was swift to assure them privately that no targets were struck inside Lebanon. But a major Israeli or American attack on Iran's nuclear facilities would make another Hezbollah-Israel clash almost, but not entirely, inevitable, given Hezbollah's undoubted status as a strategic Iranian asset. However, some Shia analysts are convinced that a US-Iranian understanding may yet emerge to head off that scenario. As for another bout of internal conflict in Lebanon, where Hezbollah clashed violently with Sunnis and Druze in 2008, there is equally little feeling that the movement is looking to pick a fight, despite deepening sectarian sentiment and political rifts over Syria. Ironically, some western diplomats have even come to see Hezbollah as a factor for stability in the Lebanese equation. "Our interests are not totally opposed," said one. Hezbollah is a natural counter to the more feared Sunni radical Salafi jihadists who have become deeply entrenched in Tripoli (and rather less so in other Sunni areas), and are regarded as a loose cannon. Hezbollah's surprisingly strong and resilient alliance with former Gen Michel Aoun's Christian faction allows it in a sense to pose as the defender of the Christians as well as of the Shia. Since early 2011 the group has been the power behind the generally pro-Syrian Lebanese government. It has been credited with running ministries more efficiently and less venally than most, though its experience in office has not allowed it to escape some of the blame for inflation, unemployment, power cuts and corruption. That may have lost it some of its gloss in the Shia political arena, where it nonetheless remains the predominant power. Some Shia observers see this year's general elections (supposedly in June but still hostage to an unresolved wrangle over a new election law) as a "determinant" in Hezbollah's effort to consolidate its position in the Lebanese political arena so that it has a solid base from which to face - whatever the future throws at it. "It has to have a strong local base for regional reasons, and because Syria is failing and Hezbollah is taking on more and more a regional role," said one. That regional role is evident most strongly in Syria, where Hezbollah is trying, as discreetly as possible, to shore up its strategic ally. Its fighters are believed to be helping defend Shia villages in Homs province and the important Shia shrine of Sayyida Zeinab on the southern outskirts of Damascus, as well as providing tactical advice and street-fighting training to Syrian forces. Some diplomats are surprised that Hezbollah is not more involved in helping the embattled regime. They and some other observers believe the movement has not been significantly weakened at this stage by the turmoil in Syria, and that even if the regime were to collapse, Hezbollah would continue to receive arms from Iran by other routes. 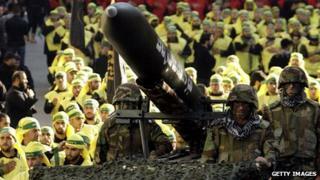 "Syria needs Hezbollah at the moment more than the other way round," said one Shia observer. As for the Bulgarian accusation of Hezbollah responsibility for the Burgas tourist attack, it is likely to prove a mild political embarrassment but not to change the course of history. Western diplomats, who had been hoping to see Hezbollah move further along the path of moderation and political engagement, were dismayed when the Bulgarian government furnished them with what one called "irrefutable evidence" of Hezbollah involvement in the bombing. Instead of reopening a dialogue which was broken off in 2008 over allegations that Hezbollah was training Iraqi militants attacking Western forces in Iraq, British officials now find themselves in the forefront of those pressing for Hezbollah to be added to the European list of terrorist organisations. Hezbollah seems unlikely to lose much sleep over that. "All these accusations against Hezbollah will have no effect, and do not change the facts or realities on the ground," said Shaikh Naim Qasem, the movement's deputy leader.